Columbus has some great city parks. A waterfall, Shakespeare in the park, the Park of Roses, the Franklin Park Conservatory. Even without events parks are things to do in Columbus Ohio. Actually I put the City of Columbus Parks in alphabetical order, above, in the list. What’s your favorite City of Columbus Park? Parks? Franklin Park for the Conservatory. Goodale for a number of events. Schiller for Shakespeare in the Park. Whetstone for the Park of Roses. And Hayden Run for…. duh! Is Columbus Commons a city park? How about the Scioto Mile? 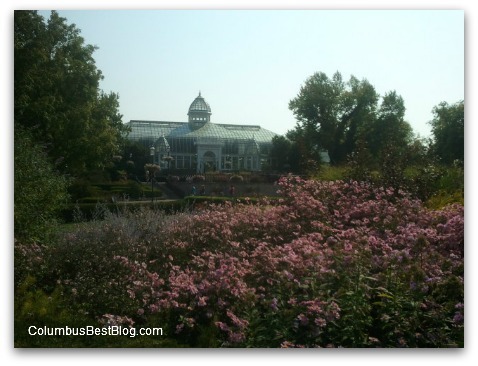 I was thinking of my favorite parks in central Ohio as “Things to do in Columbus Ohio” picking a Metro Park or two, adding in my favorite parks in a couple of Columbus suburbs but there’s way more than five parks. I read somewhere that Columbus (the City of Columbus) alone has 215 parks. Even without events going on the City of Columbus Parks themselves are things to do in Columbus Ohio. Do you live close enough to any of the parks in Columbus to use the park often? Growing up I could not imagine that having a park with a swimming pool close enough to walk to, daily wouldn’t be my hearts desire my whole life. Maybe your favorite Columbus park or parks are different from mine because you have a dog. Or like to bike, skate, swim or golf. I am not a golfer. Did you know there are seven public golf courses in Columbus, Ohio?